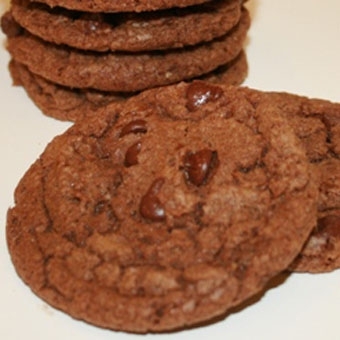 Our Double Chocolate cookie is a rich, chewy chocolate cookie with an abundance of chocolate chips in every bite. This cookie is for the chocolate lover in you. Add a cold glass of milk and escape into chocolate paradise. Size: -- SELECT -- Double Chocolate Chip Cookie 12 ct.Double Chocolate Chip Cookie 24 ct.Double Choclate Chip Cookie 36 ct.Double Choclate Chip Cookie 72 ct.Double Chocolate Chip Cookie 108 ct.